AB AUR (AB Aurigae), a new star for a new year. 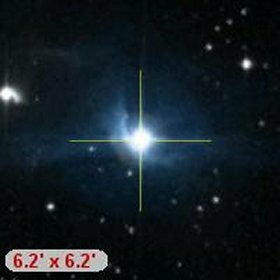 Unlike the vast majority of stars in this series, AB Aurigae (recognizable by the Roman letters as a variable) is, at seventh magnitude (a rough mean of 7.1 with a few tenths variation in blue light), not visible to the naked eye. In the southwestern corner of Auriga near Taurus and the Galaxy's anticenter, where the Milky Way is dim, AB Aur is the northern hemisphere's brightest "Herbig Ae/Be" star (named after the astronomer George Herbig). 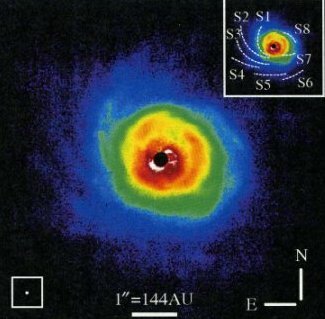 Ae/Be (HAEBE) stars are not to be confused with common "Be" stars, which are hot class B dwarfs, subgiants, and giants with emissions of hydrogen in their spectra that tell of surrounding disks produced by a combination of fast rotation and rapid stellar pulsation. Classic examples are Gamma Cassiopeiae, Zeta Tauri, and Delta Scoorpii. "Ae/Be" stars also have circumstellar disks and radiate hydrogen emissions, but instead are protostars in the process of formation. Recently born, AB Aur is a subgiant/dwarf that is in the process of settling in as a stable star. The disks of Ae/Be stars are leftovers from the formation process as the new stars, still accreting mass from their surroundings (while ejecting it as well), contract and rotate ever faster. Such disks may be the nurturing grounds for new planets, very unlike the thin affairs that surround Be stars. Ae/Be stars are the higher mass versions of "T Tauri stars," which appear largely as G through M subgiants that are contracting to become dwarfs. With strong excess radiation in the ultraviolet and infrared caused by mass infall, magnetic activity, and dust, they flock around dark interstellar clouds and vary in their light as the ragged accretion process proceeds, sometimes violently so. From their poles, they eject rapid flows that hammer into the ambient interstellar medium. At a distance of 455 light years, AB Aurigae is (like T Tauri) related to the Taurus-Auriga dark cloud, the closest star-forming region to Earth, and is associated with a local reflection nebula (which scatters starlight from dust grains). As a developing star, the class of AB Aur is insecure, ranging from B9 to A1. So is the amount of interstellar dimming by dust. Here we adopt half a magnitude and a temperature of 10,000 Kelvin to get a luminosity of 45 times that of the Sun and a mass of 2.5 Suns, which is in good agreement with that from other sources (38 solar luminosities and 2.4 solar masses; the two can be reconciled by dropping the dust dimming to 0.2 magnitudes). Surrounding the star is a face-on, highly structured dusty disk some 200 Astronomical Units in diameter that may be birthing planets (none so far found). Written by Jim Kaler 1/04/13. Return to STARS.